Shakespeare wrote, “All the world’s a stage,” and that its inhabitants “have their exits and their entrances.” There’s a dedicated group of professionals throughout New Mexico who take that phrase to heart. These people are helping to sustain the artistic community that keeps live theater viable and engaging. Let’s hear a round of applause for these 10 great places for live theater in the state. With a seating capacity of close to 2,000 patrons, Popejoy Hall is the largest venue of its type in the state. It’s part of the University of New Mexico Center for the Arts which en-compasses the Rodey Theatre, Keller Hall, Experimental Theatre “X” and the University Art Museum. Popejoy Presents is a signature series of events that includes touring Broadway musicals, live theater dance, music from around the world and comedy and drama productions. With amazing acoustics and a great atmosphere and a mission to en-rich, educate and entertain the community, a night out here is worth the admission price. True to its name, this 1900s building was an engine repair shed during the coal mining days that helped create the town. There are still pits inside for when the maintenance workers worked under the trains. Stains on the tin roof are from steam and soot from idling engines. The balcony is made from railroad tracks. It’s perhaps the only theater in the country that has a full-size steam engine on stage. The theatre comes to life in sum-mer when old-time melodramas are staged. It’s interactive theater: Cheer for the hero and heroine and boo the villain. The storied history of the Lensic includes being a place that showed “talkie” movies and vaudeville acts. Built in the 1930s, it became an entertainment landmark in town. As so often happens, it fell into a state of disrepair only to be renovated by a group of dedicated preservationists who returned it to its Spanish-style splendor and transformed it into a first-class performance venue. Today, the theater is booked 200 nights a year with a variety of live presentations from theater to music to dance. In 2000, it was recognized by the National Trust for Historic Preservation as an official project of Save America’s Treasures, a piece of history that continues to be a hub for cultural events. This theater is a work of art in which you see works of art. More than 400 tons of white-flecked stone quarried in Spain was used in the outside construction, which glimmers at night from the light emanating from the crystal lobby. In addition, once inside it has ex-ceptional acoustics in this intimate 500 seat theater. Its mission is to enrich the cultural lives of the area’s residents and visitors and it does so by bringing Broadway dramas and musicals, country and rock music, as well as touring comedians through its doors. Free public tours available Tuesdays and Thursdays. The Santa Fe Little Theater, as it was known when American novelist Mary Austin established it in the 1920s, is the oldest consistently-running theatre west of the Mississippi. Located in an historic adobe in the Barrio de Analco, the small 99-seat house creates a relaxed and informal atmosphere for both the audience and the actors. With a commitment to providing quality theater and performance for everyone, the Playhouse encourages first-time actors, writers, directors, designers and technicians opportunities to gain hands-on experience alongside seasoned professionals. Season performances range from melodrama to one-act plays to full-length dramas. In a town known for peculiarities, there’s nothing peculiar about a community theater that’s been around since the 1940s, a heyday for live theatrical performances throughout the country. The first players, known as The Roswell Players, traveled to rural schoolhouses and performed musical variety shows and melodramas. World War II interrupted the performance schedule and it didn’t get back on track until the 1960s. 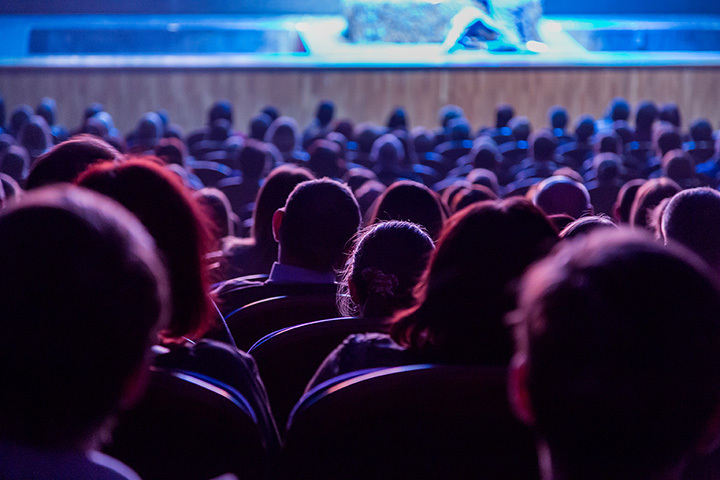 Today, the Players are considered the broader spectrum of artists who come to the Theatre to perform in mysteries, musicals, dramas, comedies and dinner theater. Recently the whole operation moved to a renovated facility in town, it’s new home. The tagline for the Shuler is “where theater comes to life.” If it weren’t for the efforts of those who like to save pieces of our past, this 100-year-old historic theater would have stayed dark. Now a state landmark, it has come alive with the sounds of plays, dramas, comedies, musical theater and concerts throughout the year. It’s also the home to the Santa Fe Trail School for the Performing Arts, a school for young people that presents three plays a year and a month-long summer workshop. Of note inside are the eight murals, showcasing historical scenes of Raton, from the Work Progress Administration (WPA) era created by artist Manville Chapman. This small, developing theater company performs at various venues in the area including at Western New Mexico University. The troupe performs a mixture of live theater productions seasonally. Actors also perform for community fundraisers throughout the Grant County communities in an effort to enrich, educate and entertain the residents of Southwest New Mexico. For more than 70 years, this little theater has been staging community theater at is best. They feature local talent, ages six to 96, in everything from one-act plays to musical productions to comedies and tragedies. The company performs at the Performing Arts Center in town which they operate on behalf of Los Alamos County. They also host play readings, informal events open to the public, throughout the year. There is nothing more engaging in theater than watching children in costume singing and dancing their hearts out across the stage. That’s what happens at the Growing Stage. It’s a feel-good family entertainment experience that will have you smiling as you enter and leave. Their summer intensive program has landed in the Top 5 of Albuquerque’s Best of the City awards for the last two years. Children ages seven to 18 learn how to cooperate, communicate, create and celebrate through participation in theater arts in year-round classes.